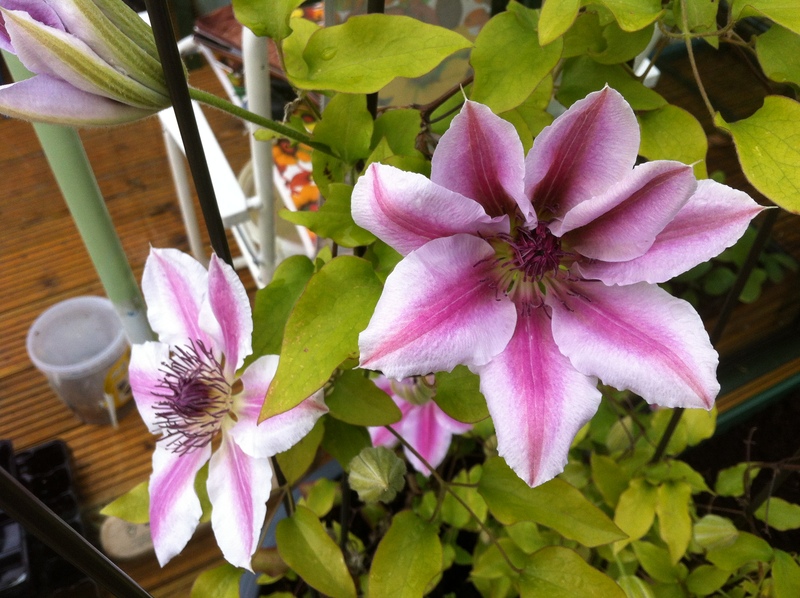 This is my clematis ‘Nelly Moser’ taken yesterday morning. I bought it in part for sentimental reasons, my mother had one in the garden of the house where I grew up, and because I thought a clematis would look ‘just right’ winding it’s way through the wires of the cordon frame at the front of the plot. The truth is that whilst it did look ‘just right’ it was too cold and too exposed, the RHS say it is hardy and will tolerate north facing but having seen its rapid demise I would disagree. So I moved it to the side of the greenhouse snapping several of the brittle stems in the process. It looked pretty awful for the rest of the year to the point that I was close to composting it. I’m pleased I didn’t. As an aside does anyone know the origin of the name Nelly Moser? I’ve googled it to no avail. Technical stuff from the RHS here. That’s strange as I can! Never mind the link that David sent you is a better one.